In February 2011 I posted a review of some Christmas books for 1874, “Nonsense for Big and Little Babies” from Judy. Among the books reviewed was A Choice Collection of Queens and Kings, and other Things by S.A. the Princess Hesse Schwartzbourg, which greatly intrigued me. It took me months to find a copy (it was actually offered to me at an almost-reasonable price), more months to have it decently photographed and many more months for me to cut, resize and otherwise edit the pictures, but I am now happy to be able to annouce that the full book is available for your perusal at nonsenselit.org. I was very surprised to find that the author was Marie Duval, a nom d’artiste for Isabelle Emilie de Tessier, usually mentioned as the artist who developed Ally Sloper, created by Charles Henry Ross. In respect to the adultery, Mrs. Unwin stated that she lived in Nelson-square, Blackfriars-road, and in the summer of 1870 Miss Duval came to lodge in her house. After she did so she was visited by the respondent, who went by the name of Granville and often remained with her all night. In the autumn of 1871 she got so disgusted with their conduct that she had them both turned out of the house. The Court considered that both charges had been proved and pronounced a decree nisi with costs against the respondent (Adcock). Marie Duval’s death is registered in Wandsworth, London, in the second quarter of 1890, age 39, (she was actually 42). In the 1891 census CHR is living (as Charles Harry Ross) at 501 Wandsworth Road, Clapham, a widower and author. He has a son, Charles Jnr., aged 16, born in 1875 in Clapham, (other sources say Battersea), who is described as an artist (Adcock). Dear Sir, ― Will you permit me to correct a trifling error in your critic’s notice of the New Royalty Theatre, which unintentionally does an injury to a very clever young lady. Mademoiselle Marie Duval does contribute every week to Judy as your critic says, but her pictures are not imitations of “Mr C.H. Ross’s absurd style” and can very easily be distinguished from that gentleman’s production, because Mademoiselle is an artist and C.H.R. is not. ― I am, dear sir, yours very faithfully, Chas. H. Ross, Editor of Judy. Judy Office, 73, Fleet-street, Oct. 14. Is this the young lady who periodically contributes to a serio-comic journal those grotesque pictures so abviously in imitation of Mr C.H. Ross’s absurd style that it is occasionally difficult to determine, with any degree of correctness, which sketches are by Miss Duval and which by Mr Ross? Marie Duval’s earliest signed appearance in Judy, 25 August 1869, p. 173. 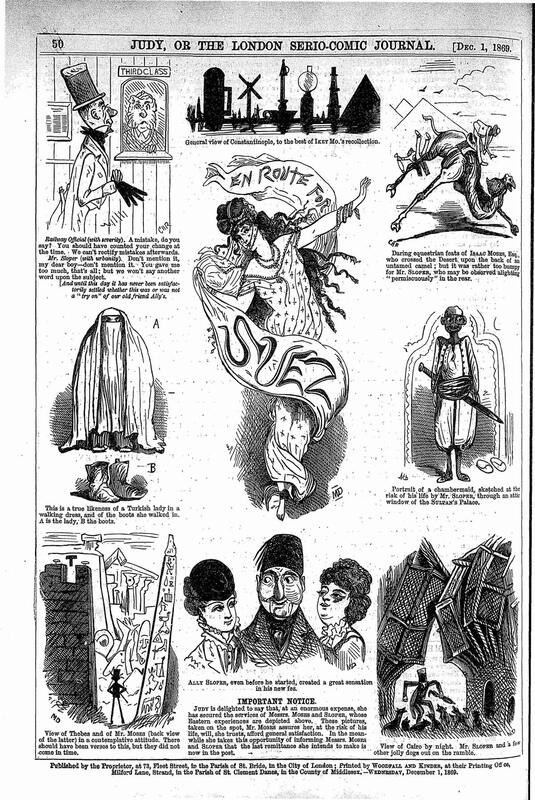 An Ally Sloper page in which Marie Duval and CH Ross collaborated. Judy, 1 December 1869, p. 50. By the way, who does those horrid little woodcuts in Judy? The large cartoon is generally very good, and so are the sketches by Adelaide Claxton, but there are always a few wretched scratches signed “M.D.,” signifying “Miserable drawing,” I suppose, though some do say it stands for Marie Duval, or something of the kind ― which are frequently very bad “translations” of the piquant illustrations of Grevin and other artists in Le Journal Amusant and Le Journal Petit Rire, two serials for which I acknowledge a strong penchant. If “M.D.” cannot draw properly or with humour, he or she should be kicked out of Judy’s sanctum ― at least this is what I should command the publisher to do were I editor. But there is no accounting for tastes, and if some editors choose to show the world what dolts they can be, there are none to say them nay in this free and enlightened country. This entry was posted in Comics, Limerick and tagged caricature, Comics, Edward Lear, Marie Duval, nonsense rhymes. Bookmark the permalink.